Pour le broth in a saucepan, add the ginger and boil on high heat. Turn the heat to medium and simmer for 10 minutes. Add the coconut milk and return to simmer. Transfer the sliced chicken and shrimps into the chicken broth and let it cook through, approximately 3 minutes. Slowly stir in the fish sauce and sugar. Then add the Thai chilies, lime juice, bean sprouts and a handful fresh coriander leaves. 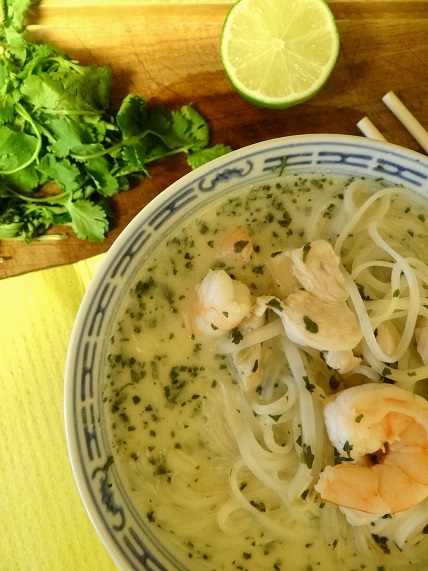 Stir in the rice noodles and serve immediately. Garnish the noodles with the remaining fresh coriander leaves. Note: I’m not too good with spicy food, so I omitted the chilies. It was still very nice. Enjoy!